If you are like me love summer but won’t dare to bare to get a tan, you can self-tan to get a glow. I recently turned my bathroom into a tanning station when I tried Cocoa Brown by Marissa Carter to get beautifully bronzed, radiant skin in just 1 hour. Skin prepping the night before using a gentle and mild body exfoliator all over my legs and arms ensured that dead skin cells are completely removed. The next day I don’t get hot and flustered and start to apply the Cocoa Brown self-tan mousse in a cool area off my bathroom. 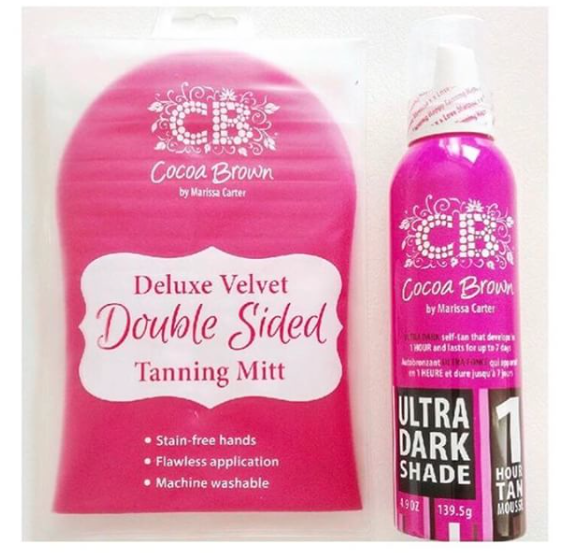 Using Cocoa Brown’s Deluxe Tanning Mitt, a luxurious, dual-sided tanning mitt to protect your hands from staining and give you the perfect tan without any streaks. I applied the tan in long, sweeping strokes, starting from the bottom of my legs and just lightly brushing my feet, the end of my arms and working in. The Tahitian Gardina scented mousse glides on evenly and leaves your skin looking flawlessly brown and not orange! Cocoa Brown by Marissa Carter has gained cult beauty status since Kim Kardashian West and her make-up artist Mario Dedivanovic both stated they are a major Cocoa Brown fans!